Maybe it would be fun to read this comic, like any ghost story, at night. Under the covers with a flashlight. I love ghost stories, especially on crisp October nights. 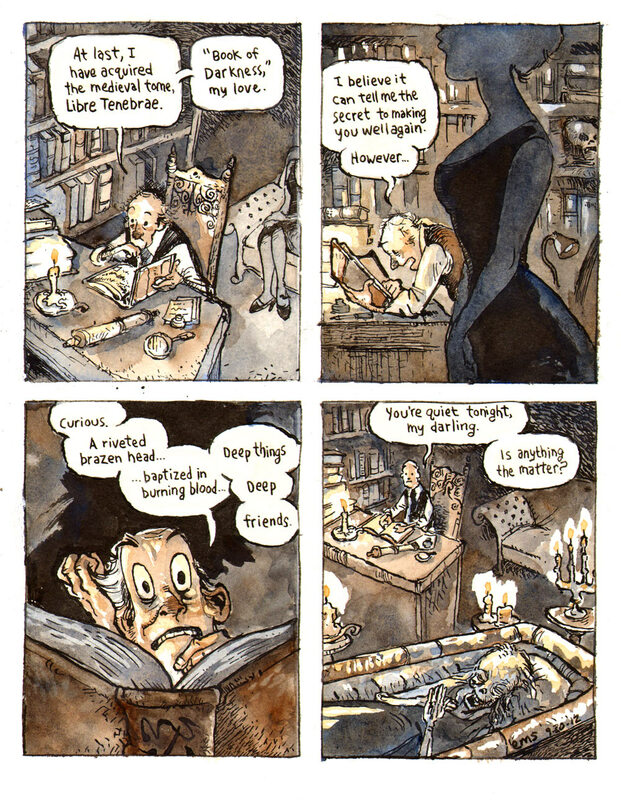 This comic came about as a submission for Illustration Friday‘s topic of the week, “book.” Nick Marsh wrote a very enjoyable, spooky bonus story for backers of the fundraiser to print “The Express Diaries,” called, “The Ausperg Affair.” The story mentions a poor man whose love for his dead wife sends him into the occult and madness. Nick’s good Cthuluery inspired this comic. Here’s a bit more about the process I used to make this comic. First, I wrote it with a rough drawing in my sketchbook. I knew how I wanted it to end, so I started with the 4th panel … well, let’s watch, shall we? 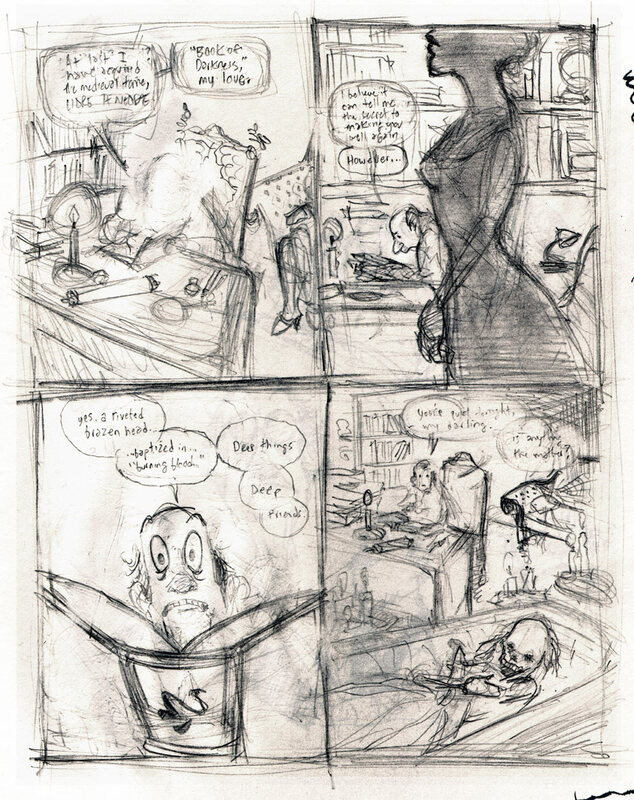 I lightly redrew the comic on a watercolor block in 2H pencil. (See “Painting” below.) This gave me a chance to correct some of the drawing, especially the acting going on in panel 3. Then, I redrew the comic in ink, choosing to use a nib pen instead of my trusty Lamy Safari fountain pen. I like the accidental lines I got, but I made a mistake thinking I could letter the comic with a nib pen. I ended up redoing the word balloons on bristol board with the Lamy and cutting them out and pasting them on. Live and learn. I’ve been making my comics in my sketchbook for the past month. I like the idea of having them all in one place, and in the beginning, the low quality of the paper didn’t matter because I wasn’t painting as much. I’ve been enjoying the watercolor phase, though, and this old sketchbook paper doesn’t hold up too well. 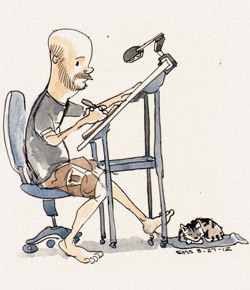 The paper buckles and I usually leave the sketchbook under a pile of heavy books all day to try to flatten it out. I recently bought a Fluid watercolor paper block, not too expensive and does the trick. Blocks are like pads of paper but are glued on the edges. This way you don’t have to stretch or wet the paper and it keeps the paper from buckling. Here’s a look at painting the 2nd panel in octuple time. Panel 1: A man sits at his desk, reading a large book. A woman sits on a couch behind him. “At last, I have acquired the medieval tome, Libre Tenebrae,” he says. Panel 2: “I believe it can tell me the secret to making you well again. However …” The woman walks by him. Panel 4: The man looks up from his study. “You’re quiet tonight, my darling. Is anything the matter?” He’s talking to the corpse of his wife. Great illustration and wonderful post! I love the behind the scenes portion! Thanks so much, Hannah. I always like seeing people’s processes so I was itching to share some of my own. I’m glad you stopped by. Eric, that is a creepy little cartoon. Makes me think of the end of the Psycho movie. I love your art work! Excellent! That’s high praise, Barb. I can totally see the similarities. Dan, thanks so much for the encouraging comment, and in Lovecraftian prose, no less! I have thought a little bit about prints, but I don’t really know what comics people would want in that form. Maybe this one will do, I don’t know. I certainly would donate to your very worthy cause, but you don’t want this original piece. It’s a big carved up mess with horrible lettering and it smells like pickled ocra. 🙂 Thanks again, old friend. Wow, your work is amazing! I’m going to devour your site now!! Keep it up!